Known as a place of perfume production in the ancient ages, Phaselis has national park status in Turkey. Tourists reach the ancient city by their own cars or yacht tours across the sea. Dating back to 309 B.C., Phaselis invites tourists to enjoy swimming under pine trees on its coasts located right next to historic artifacts. Kemer District Governor Mustafa Cihad said the area made great contributions to the district in terms of tourism. “It is a coastal town and located in a forestland. Over 100,000 visitors come to the city each year. They can spend a whole day here,” he said. 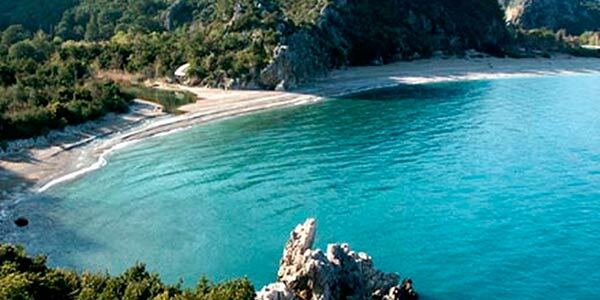 According to information provided by the Antalya Culture and Tourism Directorate, 88,772 people visited Phaselis in the first seven months of this year. Income provided by tickets and museums cards sold in the ancient city since January has totaled nearly 900,000 Turkish Liras. The number of people who visited the ancient city for free was 21,166 in the same period. Phaselis was founded in the 7th century B.C. The city was the most important harbor of the eastern coast of Lycia with three ports: The northern harbor, the protected or southern harbor and the war harbor. Phaselis has a spectacular 20-24-meter-wide street in the middle of the city, and the Hadrian Door can be found at its south end. There are sidewalks and shops on both sides of the street, as well as a bath, agora and other ancient public places which are worth seeing. The ancient city has also become a symbolic battle at a time when hotel investments along Turkey’s western coasts have dramatically increased. Activists have not only criticized the damage to natural areas by the construction of hotel facilities, but also slammed the privatization of beaches and coastal areas that had previously been open to the public for years. A proposed hotel named the Dream of Phaselis was slated to have 280 rooms and would have been built on the limits of the national park, while a significant part of the facility would have been inside the first-degree archaeological site, where no construction is permitted under current legislation. The construction, which had been suspended in November 2014, was canceled by ministry decree in May 2015.